I thoroughly recommend that, if you enjoy outdoor art in beautiful venues, Sculpt at Kew 2017 is well worth a visit. And not just because I have three pieces on show. 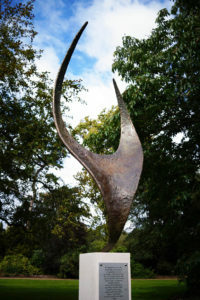 30 sculptors are showing around 80 works in the simply gorgeous setting of the Royal Botanical Gardens at Kew – in addition to 40-50 indoor sculptures. 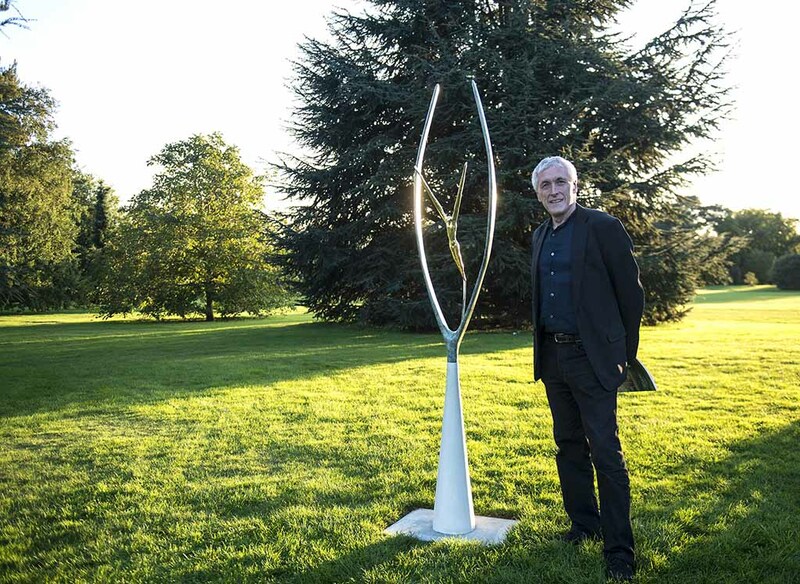 Kew is looking lovely at present, and much thought has gone into placing each work in its perfect setting – I hugely commend the curatorial team for the creativity that’s gone into how the show is set out. 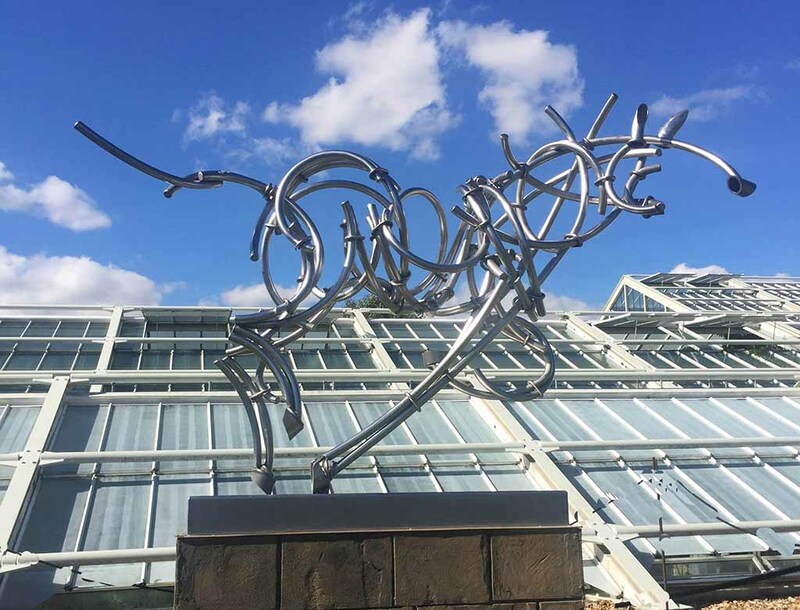 See Guy Portelli’s dynamic Equillineus, set against the backdrop of the Princess of Wales Conservatory. Or look at Simon Gudgeon’s large Leaf Spirit, designed to be placed against a leafy wall or hedge. For my own work, I feel I almost have pride of place. My What I Do is Me is one of the first pieces you see as you enter the Gardens from Kew Green, and very close to the gallery where several of my indoor pieces are exhibited. Meanwhile my two latest outdoor sculptures, Conception III (Shown at the top of this blog) and Leap into Life (below with artist), are perfectly positioned on either side of the famous Broadwalk – said to be the longest double herbaceous border in the world, and looking spectacular even in mid-September. It’s deeply satisfying to see one’s work in such a great setting – and equally satisfying to see and hear the appreciation of so many visitors, whether they have come for the sculpture or the gardens. 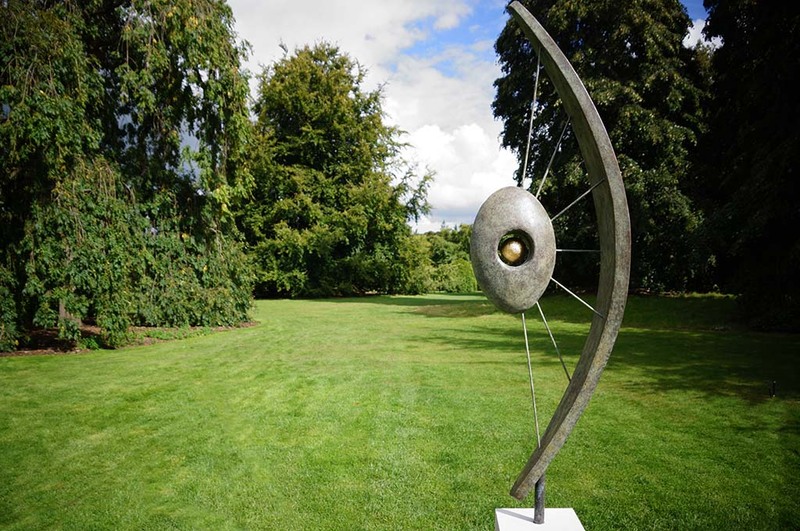 Sculpt at Kew is open daily until 15 October, from 10.00 a.m. until 6.00 p.m.. Entry to Kew Gardens is charged, but the exhibition is free once you are in. See www.handmadeinbritain.co.uk/shows/sculpt/exhibitors/ for details of all the work on show – though you really do have to see it in situ at Kew. 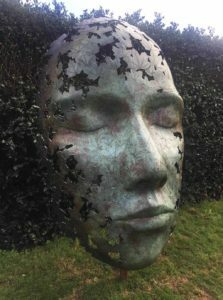 And please also look at my new website to see a range of my work: www.timhollins-sculpture.com.